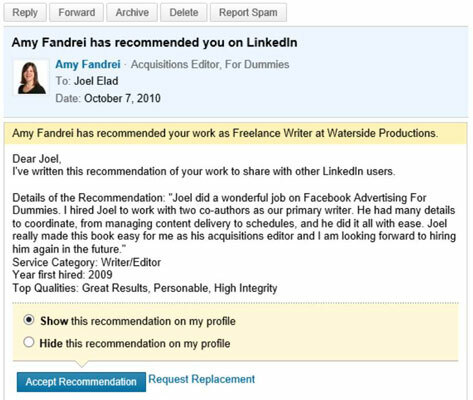 Every time you receive a recommendation from someone else, you see a message in your LinkedIn Inbox. You will want to manage these to keep tabs on what shows up on your profile at any given time. Accept and show it on your profile. Click the Accept Recommendation button but also make sure the Show This Recommendation on my Profile option is selected. Accept and hide it. You might choose this option if you don’t want to decline the person’s recommendation, but for some reason you don’t want to display it. Here, just make sure the Hide This Recommendation option is selected before you click the Accept Recommendation button. Request replacement. If you aren’t completely happy with the person’s recommendation, click the Request Replacement link to be given the opportunity to send him a brief note explaining what you would like changed. Archive it. This removes the recommendation message from your LinkedIn Inbox. It is available for later retrieval, just not as easily as if you choose the Hide option. You simply have to click the Show Archived Messages link when looking at your LinkedIn Inbox for recommendations.